Tuscany is a region where you can definitely experience “La Dolce Vita”. Like its landscape, the style of life is smooth and relaxed, with a strong agricultural heritage. Landscapes, traditions, history, artistic legacy. Seven localities designated as World Heritage Sites. 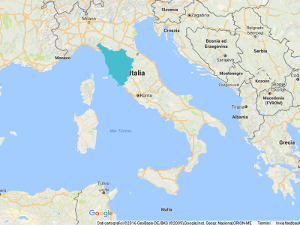 2 international airports (Florence and Pisa). The iconic countryside of Tuscany is a work of art, a place where centuries of human intervention have transformed the rural scene yet respecting the environment, with rolling hills covered by neat vineyards and silvery olive groves, where spaces are defined by elegant cypress trees. Yes, you know that, but it’s still beautiful. Tuscan food is the quintessential expression of the region. It’s a “cucina contadina” (farmers cooking) rich, simple and tasty. Starting with the huge selection of cold cuts, my favorites are the “Finocchiona” (a kind of salami with wild fennel seeds) and the “lardo di colonnata” ( Pig lard cured in marble containers in the village of Colonnata), to the healthy Ribollita (a vegetable soup) and Panzanella (kind of hearty salad with tomatoes, cucumber and left over bread), not to mention its valued olive oil and the famous “Fiorentina”, a thick cut of local veal that has to be cooked very rear. Tuscans have a great sense of humour, dressed with a hint (well, may be a bit more) of satire. If you have the chance ask a native to read and translate for you the “Vernacoliere”, a newspaper that teases everybody, of course tuscans first. In Tuscany you’ll breath the Middle age in every village, especially if you have the chance to be involved in one of its many local festivals,where locals dress ancient costumes and parade across the old town. The Palio di Siena is the most famous one, but you’ll find a lot especially in spring and summer in many villages. Tuscany always had a clear inclination to beauty and good life, the first Etruscans were very stylish compared to Romans, this love for beauty reaches its top during the Renaissance, the most powerful moment of Tuscan and Italian history. Have a thermal bath, the only difficult thing is to choose one, from the classy Montecatini Terme, to the cool Rapolano, until the stunning Saturnia, you must include an half day at the thermal bath on your trip to Tuscany. Ok, everybody has been in Florence, San Gimignano, Montalcino, Pisa and so on. So why don’t you take the chance to discover some small yet super neat village out of the beaten track? We’d suggest Monteriggioni, Pitigliano and Sovana. Bagno Vignoni…or just have some detour and you’ll fall in love. A journey between Umbria, Tuscany, and Lazio, to discover the ancient Etruria, land of the refined civilization of Etruscans. We’ll pedal along the Via Francigena, immersing ourselves in the silences of Val d’Orcia with its well groomed hills and vineyards producing the Vino Nobile di Montepulciano and the Brunello di Montalcino wines, then crossing the colorful Maremma countryside with its tufa stone villages to end our journey at the fascinating thermal baths of Saturnia.